At the smart Erbil International Airport, European businessmen, soldiers and security experts were rubbing shoulders with UN development specialists. Lufthansa, Austrian Airlines, Turkish Airlines, MEA and other major airlines were busy inaugurating flights to this new “hip” hub of the Middle East. Never mind that the government of the Kurdistan Region kept clashing with the capital city of Baghdad, over the oil reserves, over the extent of self-rule, and many other essential issues. Never mind that (as it often happens in extreme capitalist societies), the macroeconomic indicators were suddenly in frightening contrast with the growing misery of local people. As long as the oil was flowing, as long as this self-administered region was pledging eternal allegiance to the West. But then the economy began slowing down, and then it halted. All social indicators nosedived. The happiness of Western and Turkish investors, and especially of the political handlers, looked increasingly out of place, becoming almost insulting to those who were trying to make ends meet. But the dispute with Baghdad and the financial shortfall are not the only issues that led to the present situation. Social policies in the Kurdistan Region had long been grotesquely inadequate, and the welfare of the local population had never been considered a priority. “Not a paradise in the heart of the charred Middle East?” I ask, ironically. I know that. I saw those “ordinary people” digging out dirty roots for dinner, in the middle of the villages located right near the oil refineries owned by KAR, the Kurdish oil company. On February 9, 2016, protesters flooded the cities and towns of Sulaymaniyah, Koya, Halabja and Chemchemal. Suddenly, it was clear that the “success” of Iraqi Kurdistan has been nothing more than a house of cards. It became unsustainable, and it began its gradual collapse. “Do you get any money, any substantial help from the United States?” I ask. Is this the end of euphoria? The road is surrounded by garbage dumps. Electric wires and high fences cut through the land. And the land lies idle; there is almost no agriculture left here. It is all oil, military bases, and inactivity and apathy. Our car is stopped at several checkpoints. My colleague is harassed, because she has a Syrian visa in her passport. I have Iranian visa in mine… As our documents are being scrutinized, Turkish trucks and road tankers are sailing by, freely, enjoying undefined but obvious privileges. South of Erbil, in the villages near Qushtapa, the road is severely damaged by Turkish and Kurdish tankers and trucks. On this thoroughfare connecting Iraq, Turkey and Iran, there seem to be more trucks and tankers than ordinary cars or buses. It is all about business, about “trade.” People hardly travel. A few days ago, outraged citizens blocked the road, demanding changes in social policies, and that the government take action. I make it all the way to the village of Degala. There, guards and local people look at me with suspicion. “Why are you protesting?” I ask. As we drive towards Erbil, I see again that total neglect: fields lie idle. There is no diversification of the economy. And now, there is a war. One year ago, I managed to get all the way to the front line, just 7 kilometers from Mosul. I was shown the hills occupied by ISIS, I saw the destroyed bridge over the Khazir River, and then Sharkan village, Hassan Shami, and other villages bombed and ruined by the US forces. He treated me as if this was my first warzone. Hundreds died. It was obvious, and the relatives of the victims later confirmed it to me. There was hardly anything left of the villages. Most likely, most of the villages vanished during the attack. Colonel Shaukat was trained primarily in the UK. He knew how to talk. Families are on both sides of the line, and the mobile phones are working. It is possible to keep informed about the situation in Mosul, by simply calling relatives and friends. “Not unlike the Libyan scenario?” I interrupt him. “That happens in many countries that the West destabilized,” I utter. He does not know. He only knows that it has been happening in his city and country. When I returned to my hotel, a British dude was practicing politics with a female receptionist. Military talk, about training local military folks, and then oil production talk – it is all in vogue, or at least acceptable as a social interaction between “hip” locals and macho expats. There are all those private security experts, military men, instructors, intelligence officers and advisors. It is one huge mind-blowing medley of military bravado, openly paraded and spiced with turbo-capitalist dogmas. I am studying local sources. And more I do, it becomes obvious that things are going from bad to worse. The poverty increased dramatically, too. And the Region has extremely lax ways of calculating poverty: if a family does not spend IQD 105,000 ($87) in a month, the family is considered poor. That is $21.75 per person per month, lesser than a dollar a day! Not to mention, that Kurdish families have, on average, more than four members. I ask my driver how much a family of five needs to survive in and outside Erbil. “How many families are making that much?” I wonder. “Not even one half… Much lesser than half,” he says. I am puzzled; I want to know, to hear from the people of “the Region,” whether their lives have truly collapsed. But Turkish truck and tankers are moving up and down the roads, day and night. 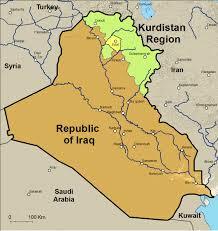 But the allies of the Kurdistan Region do not seem to be too interested in the plight of local people. While the social system is collapsing, Erbil is turning into one of the most segregated places on earth: with 12-lane roads, fragmented communities, absolutely no public transportation, almost no cultural institutions, but plenty of malls for the rich, as well as luxury hotels for the expats. In the area where the majority of people live on less than $1 per day, a decent hotel room now costs over $350, and the daily rate for car hire from a hotel is around $400. There is great fear in the Kurdistan Region. And fear is feeding anger. And anger may lead to violence against the corrupt pro-Western regime.